In both common perception and from the perspective of much modern economic history, a historic shift stands out in the industrialized world: three decades (1945-1973) were marked in the major market economies by strong growth and full employment, and followed by decades when crises and booms alternated, before they all crashed into the Great Recession in 2008. In France, the first period has been nicknamed les trente glorieuses (the Glorious Thirty), after a book published by Jean Fourasti√© in 1979. On top of economic prosperity came a modernization of the country's economic, social, and cultural structures. The second period, by contrast, some French scholars characterize as "piteous," because France proved incapable of curbing mass unemployment. Such a demarcation, whether implicitly or explicitly, makes the first oil crisis of 1973 the watershed of the economic turn from glorious to piteous. However, I will argue that this watershed had much more to do with the new industrial revolution, this time organized around information and communication technologies, which began in the 1970s. It is this revolution that forms the background for the four recent decades that this book covers. A quick overview of the year 1970 will contextualize this chronology. Performance of the European economies remained good-even excellent. The fifteen countries that would form the European Union enjoyed annual growth close to 5%. Employment figures also seemed very good. The Federal Republic of Germany announced an unemployment rate of only 0.5%; Great Britain had 2.2%, and France 2.3%. However, a deeper analysis shows that France, like several European economies, was experiencing the first disequilibria. Unemployment was slowly rising. In 1965, it had been 1.5% in France and 1.2% in Great Britain. The rise accelerated throughout 1970. In France, the number of job seekers increased by a quarter between January 1, 1970, and January 1, 1971; and the situation deteriorated even more the following year. Almost 600,000 French workers were unemployed. Jobs decreased in construction and in public works; young people and women were the most affected in other sectors. The British economy was the sick lady of Europe. Economic growth there was erratic, and the pound sterling was regularly devalued. Inflation soared starting in mid-1970, and a year later it exceeded 10%. Meanwhile, across the Atlantic, the United States was apparently stuck in a situation that contrasted with other developed nations. The world's principal economy was carrying out a major war in Vietnam, with half a million men engaged on the ground. After a very remarkable 1969, the unemployment rate in 1970 rose back to 4.9%. This was still lower than in 1964, that is, before the massive American commitment to the war in Indochina. But the main reason for the unhealthy economy was that several years before the oil crises, the economy was in stagflation-a mixture of inflation and the absence of growth. Annual growth of GDP was only 0.2%, yet the rise in consumer prices reached 5.7% during that year. In fact, inflation accelerated after the second half of the 1960s and would not return to low levels until the end of the century. In 1970, the dollar fell sharply againstthe deutschmark. In August 1971, president Richard Nixon decided to suspend the convertibility of the dollar into gold, signaling the crumbling of a system that had been in effect since the 1944 Bretton Woods Conference. He also established a 10% tax on imported products, underscoring the loss of competitiveness of the American economy. Nevertheless, Western business, especially American business, was quickly developing automation in both the industrial and administrative spheres, meaning the use of automatic machines that required limited human intervention (robots and calculating machines). In reaction, the USSR made the automation of industry an essential axis of its 9th Plan (1971-1975). But despite these technological advances, American growth had been faltering for several years. Fundamentally, the motor of economic growth and competitiveness-gains in the hourly productivity of work-was crumbling (figure 1). From an annual pace of 3% at the start of the 1960s, the gains gradually diminished, without any particular break during the oil shocks. A trough below 1.5% was reached during the 1980s. It was only after the mid-1990s that hourly productivity in the United States would recover an average growth higher than 2%. The United States was not the only country touched by the productivity slowdown. Angus Maddison's breakdown of growth over two sub-periods, 1950-1973 and 1973-1992, clearly shows the cost of the reconfiguration phase. The factors he took into account in economic growth arose from: 1) the evolution of the number of hours worked (the volume of labor); 2) the accumulation of capital; 3) the effect of foreign trade; 4) economies of scale in productivity; 5) improvement in the quality of the labor force (level of training); and 6) a residual component. These factors were combined to achieve total productivity growth, and this figure was interpreted as the visible contribution of technological progress in the wider sense. The slowing of growth between the two periods (i.e. after 1973) is common to the United States, France, Germany, and Japan. The effect of foreign trade is systematically minor. The most striking thing is that the accumulation of capital remains rapid, accounting for more than 3 percentage points of the growth from 1973 to 1992 in all four countries. But this accumulation was accompanied by a drop in the productivity of capital. From 1973 to 1992, the technological transition was ensured by the renewal of capital, but this had not yet been translated into gains in efficiency. In fact, the apparent contribution of technological progress to growth fell between 1 and 2 percentage points between the 1950s and 1960s and the following two decades. Again, it was only in the mid-1990s that several countries began to recover sustained productivity growth. What does this abrupt break in the growth of productivity in the second half of the 1960s signify? I think it signals the transition from one industrial revolution to another, specifically from a Fordist regime to the "new economy" (or "knowledge economy") that was induced by the spread of information and communication technologies (ICTs), of which industrial automation was the prelude. The United States would henceforth be the cradle of successive technological waves, from computers to smartphones via the Internet. These technologies were, foremost, responses to demand from American firms, which possessed a breeding ground of personnel who were better educated than in most of the major industrialized countries (including France), employees who had the capacities to adapt and to be mobile. These new technologies (and the organizational styles that would be associated with them) favored the most qualified in the workforce; on the American model, ICTs would require flexibility in both the nature of work and in the structure of employment. American predominance would therefore have major consequences for the characteristics of the industrial revolution that we will examine more closely in the chapters that follow. 1. The performance of these technologies enjoys rapid progress that may extend over several decades. This progression is accompanied by a collapse in hedonic prices: from one year to the next, a more advanced version of the technology is available at a cost similar to that of the previous version. In the case of ITCs, the progression is dual. First, the basic components see their operating power, their storage capacity, and their miniaturization all advance in an exponential manner. On top of that, waves of innovation overlap each other: computers, for example, go from low-speed Internet to high-speed, then to the current mobility and immateriality of "the cloud." 2. GPT use spreads across the whole economy. And this use intensifies. For example, from 1992 to 2007, the proportion of Internet users within the OECD went from 2% to 66%. Moreover, this process is worldwide, extending over the last decade to countries with very low average incomes. 3. These technologies improve the processes of innovation. ITCs are widely utilized in all realms of creation. All scientific domains benefit from it, ranging from simulation in aeronautics to human-genome sequencing in biology. In addition to their calculating power, ITCs facilitate exchanges among actors engaged in various kinds of innovation. By cutting through a mass of research in different fields of economics and management, we may penetrate into the "black box" of this industrial revolution and inspect the various mechanisms at work, and their consequences, over four decades of the "new economy" that was to last until the eve of the financial crisis of 2008. The key point is that the process generated by a GPT is long. It is only after a phase of reconfiguring the methods of production, of adaptation by institutions and workers, that we observe the productive benefits of this technology. This period would last two decades in the case of electricity. It would be of the same order of magnitude for the first wave of ICT. What are the consequences of this protracted productivity leap? The collapse over several decades of productivity gains induced tensions in both prices and employment. The mechanism is simple, formalized since the start of the 1970s in the notion of NAIRU: the non-accelerating inflation rate of unemployment. Gains in productivity allow firms to respond to employees' salary demands without having to increase the prices of goods. But when these gains diminish, firms (in order to conserve their profit margins) finance salary increases by raising prices, thus creating inflation. This inflation itself modifies the employees' expectations: in turn they demand wage hikes, which stimulates demand, hence monetary creation. To avoid increasing prices too much, firms then cut jobs, which reduces their overall salary costs. At the macroeconomic level, this translates into a rise in unemployment; in turn, the fear of losing one's job associated with the rise in under-employment, and the competition for jobs, both work to limit wage demands. We then arrive at a new equilibrium characterized by both higher inflation and higher unemployment. Thus, technological transition carries with it a risk of inflation. The oil shocks catalyzed this. In an exogenous manner, they increased costs for businesses, and they deeply affected agents' expectations about inflation. This led to a sharp rise in inflation-well beyond the impact of oil prices alone-in Europe as well as in North America, in the second half of the 1970s. As we shall see in the rest of this book, the policies adopted in most countries to break this vicious wage-price cycle would enable them to achieve lower levels of inflation starting in the second half of the 1980s. Then, starting in the 1990s, the rising power of the new economy took over. On the one hand, North American and many European economies recovered a total productivity growth based on long-term factors. On the other hand, ICT products, either by themselves (for example, computers) or as incorporated into other products (automobiles) or into services (communication), represented a significant proportion of consumption. But thanks to rapid technological progress, the prices of the latter declined quickly, with a major deflationary effect. This mechanism is still at work today, leading to low underlying inflation. Thus, despite major budget deficits in 2009 in all the OECD countries, no inflationary pressure has emerged. Inflation stabilized below 2% in the eurozone in 2013, while Japan was trying to extricate itself from protracted deflation. The return of sustained growth in productivity (which initiated a virtuous circle) came about through a reshaping of the organization of work within firms. American and then European companies developed innovative ("high-performance") work practices that gradually took the place of Taylorist modes. These practices enabled extracting productivity gains from the use of information technologies, generating a new and flexible style of production. Thus, even a country that did not produce ICTs could gain in performance by means of industries that made use of these technologies. We may observe recurrent adoption of certain key and complementary work practices: work in autonomous teams, rotation of tasks, approaches to quality control and to just-in-time workflows. These approaches comprise a set of procedures implemented to achieve high quality standards. The procedures might be formalized-in order to obtain an ISO (International Organization for Standardization) certification, for example, in Europe-or they might evolve slowly, continually improving the production process. The spread of innovative work practices was rapid in the 1990s. The growth in the number of ISO-certified firms was remarkable, with a quintupling in most OECD and emerging countries in five years. Organizational changes also affected the frontiers of enterprise. Just-in-time production allowed a segmentation of wealth creation through increased use of subcontracting. The complementarity between technology and work organization involved all sectors, in industry as well as services. For example, ICTs enabled optimizing flows-of products, clients, and employees-in major corporations. The accelerated modernization of the retail and wholesale trade in North America, associated with the takeoff of the big-box distributor Wal-Mart, would contribute around half a point annually to American growth in the second half of the 1990s. Beyond the technical complementarity between technologies and innovative practices, ICTs increase the exchange of data and the effectiveness of the innovation process. The consequent acceleration of innovation then pushes the ensemble of businesses in all sectors, even those that are not very ICT-intensive, to engage in just-in-time production. In parallel, the search for flexibility requires both an intensification of work and an enlarged pool of precarious workers, either temps or on short-term contracts; firms have found young people who are just leaving the educational system to be a breeding ground for short-term hires. Moreover, the pace of business creation and destruction adds to the instability of jobs. Even if large enterprises try to maintain an internal work market by retraining their existing personnel, the process of organizational-and especially technological-innovation is associated with high employee turnover. In the European countries, the proportion of the working population that from one year to the next has either changed occupation, found a job elsewhere, or become unemployed has typically increased from 15% to 30%. This pattern specific to flexible production has been everywhere accentuated by the restrictive policies of the "rigid" labor market; the rationale of these policies is precisely that the right to work should not be an obstacle to the processes of innovation and wealth creation. Flexible production also has a direct impact on the activity and influence of trade unions. The flexibility of schedules, the reduction in work breaks, the direct transmission of instructions among employees, and project teamwork all tend to eliminate periods when employees can find each other within the company and thus organize collectively. The development of multitasking and task rotation also tend to reduce the pertinence of classification by detailed occupation, making it difficult to mobilize collectively around a common identity. The intensive use of on-site subcontracting and of fixed-term or temporary contracts fragments the personnel within the same workplace, adding an additional obstacle to the emergence of a union counterweight to management. Moreover, the unions that were powerful in the 1960s were built on a working-class identity. The acceleration of tertiarization of the economy and the rise in education have likewise reduced the pool of union recruits. In fact, after a phase of relative stability during the 1970s, the de-unionization movement became massive in the 1980s in most of the OECD countries (table 1). This erosion is particularly clear in the English-speaking countries where unions were initially strongly implanted (Australia, Great Britain, New Zealand, and Ireland). Countries where collective bargaining continues to play a structuring role (as in the Netherlands and Germany) have not escaped this process. This is also the case in France, which has nevertheless tried to strengthen the scope of its unions. With an already weak level at the start of the 1970s, since 1990 France has had the lowest share of unionized workers within the OECD-below even the United States. In short, only countries where the unions institutionally guarantee the main social benefits to their affiliates, notably regarding unemployment insurance, have seen stability or progress in the unionization rate over thirty years. In fact, the emergence of large-scale unemployment in the 1970s provoked waves of unionization in order for individual workers to be able to benefit from the associated collective benefits. This was the case in all the Scandinavian countries. In 2001, Belgium had a unionization rate of more than 50%, comparable to Norway. Let us linger over the Belgian case and the lessons we may take from it. Non-union workers are insured against the risk of unemployment by a government body, the Caisse Auxiliaire. For those in the unions, their organizations take part in the management of the risk as recognized bodies for paying unemployment benefits. The jobs bureau, the Office national de l'emploi(ONEM), determines entitlements, but the request must be introduced via these bodies. The union payment offices help workers fill out forms and then pass them on to the ONEM. They serve as permanent intermediary with the ONEM and make sure that it respects the rights of the unemployed. On the salary level, Belgium has kept a strong indexing of wages to prices, and has a minimum wage that is among the highest in the OECD. Thus, Belgium challenges the view that one might call "post-culturalist," which sees de-unionization as a phenomenon linked to a low degree of cooperation in the economy and to state regulation of wages. Moreover, Belgians are culturally and socially much closer to the French or the Germans than to the Scandinavians. This is corroborated by the World Values Surveystudies that are widely used in culturalist research. Although in Belgium and the Scandinavian countries, maintaining the influence of the unions does not seem to have been an obstacle to business reorganization, elsewhere, the decline of unions may well have been an accelerator of this reorganization. The retreat of a union allows firms to replace general salary increases with incentive tools that complement multitask organization. Similarly, it usually requires a reorganization that modifies job contentsand may at least temporarily cause deterioration in working conditions, or even displace the boundaries of the firm. The decline of trade unions is also linked to capitalist movements. On the one hand, liberalization and deregulation of major monopolies, and corporate mergers and acquisitions, shrink union bastions, or dilute them. On the other hand, these trends are facilitated by the weakening of the unions in their midst. However, the move to privatization originates from clear ideological choices in many English-speaking countries, or in Europe from the principles of free competition. It is also imposed by a "pragmatism" in the economic context that was inherited from the technological transition phase. In many countries, and especially in the United Kingdom and France, privatization offered an important source of revenue for the government, allowing it to smooth out the budgetary consequences of the atrophy of growth, and even to develop plans for investing in the knowledge economy. Privatization and deregulation-for example in air transportation-also fostered, through competition, a drop in prices, which helped counter inflation (accentuated by the negative impact on the salaries of employees in these enterprises). In telecommunications, putting operators into competition with each other not only reduces prices but also fosters the spread of innovations; thus, without the deregulation of this sector, the development of high-speed Internet in France would have been slow and limited to a fringe of consumers and companies. Thus, the new economy has also been facilitated by the deregulation of certain public services. On the other hand, the trend toward capitalist reconfigurations of private businesses (where mergers and acquisitions are a classic phenomenon) thrives during the assertion of a GPT. Rapid technological progress induces accelerated depreciation of existing capital. Hobijn and Jovanovic show that the global collapse of stock prices in the United States after the start of 1973 (several months before the first oil crisis) was due to the awareness among actors of the emergence of the information technology revolution. The advent of the first microprocessor, produced by Intel in 1971, made palpable a "law" enunciated by Gordon Moore, the director of this firm, a few months earlier: the speed of the processors doubles every 18 months. Seen in detail, it was not the companies most exposed to soaring oil prices whose value declined, but those most closely tied to "old" capital. In parallel, new actors entered the new growth markets. Taking into account the cost of entering such markets-the costs of acquiring a reputation, of adapting capital, of reorganization-meant that acquiring or merging with these new actors (the first movers) became the privileged route for firms wishing to invest in these markets. Many Internet startups were bought or merged in the 1990s, before becoming predators themselves. This movement has enabled extracting exceptional levels of profitability during phases of synergy-which, however, are by nature short-lived. The massive capitalist reconfigurations in the last two decades of the twentieth century also required vast financial engineering. Therefore, it was long the basis of the growth of the major international business banks and the investment departments of the generalist banks. In addition, the ICTs facilitated sophistication in finance. Thus, in the 2000s, these banks were able to find a driver for growth, this time without any actual link to the real economy, in securitization (for example of subprime loans), before they collapsed at the start of the financial crisis of 2008. Despite this crisis, the financial industry carries major weight in most of the developed economies. The interactions between globalization (the internationalization of trade, at least) and the new economy are more complex. The reinforcement of competition among countries of the global North and between countries of the global North and South, as facilitated by multilateral, bilateral, or regional free-trade agreements, tends to accentuate the process of externalization and to stimulate innovation and corporate internal reorganization. Firms develop defensive strategies of innovation that permit maintaining their competitiveness without resorting to either relocating or abandoning a market. The targeted search for production of certain components in low-wage countries may be part of this attempt to maintain competitiveness and national jobs; for example, the exporting power of Germany partly lies in localization of the low-value-added segment of production in the countries of Eastern Europe. Overall, one may interpret the relative weakness in the preponderance of trade in the OECD countries with low-wage countries as a result of these defensive strategies. This internationalization is also a catalyst for innovation in ICTs. In effect, trading goods and services from one country to another presupposes intensive recourse to ICTs-and guarantees that the new technologies will have vast potential markets. In return, progress in these technologies facilitates commerce and the relocation of activities, notably in digitalized services (finance, call/customer service centers, data processing, etc.). In fact, the movement to transfer activities has not yet stabilized. The new forms of competition in quality and in time that have been made possible by information technologies require the proximity of firms to markets. Responsiveness to the chaotic evolution of demand and just-in-time production makes it costly to be overly distant from suppliers. The quest for cheap labor also becomes more difficult, since the growth of emerging countries is accompanied by internal salary inflation. All these transformations have had impacts on workers. In addition to reducing job security, they have abetted rising inequality. International competition, de-unionization, and technological and organizational changes are the principal factors explaining the spectacular rise in inequality, both in salaries and in jobs, starting at the end of the 1990s. A considerable literature tries to differentiate and weigh these various factors. The multiple interactions explain why these studies lead to disparate findings. These factors probably tend to mutually reinforce each other. However, most studies agree that technological and organizational changes are the driving motor of inequality. In fact, any new technological wave that has a tendency to make experience obsolete creates a bias in favor of the most qualified workers and those with high adaptability. Thus, it reduces the relative demand for the less qualified-particularly when they are "seniors"-and increases the wage heterogeneity within groups that are qualified. In the United States, the rise in wage inequality was at first very pronounced in the lower half of the salary (and income) scale, with even a slipping of real salary at the lower end of the spectrum, accelerated by the stagnation of the national minimum wage. Inequality did stabilize in the lower half of the salary distribution during the 1990s. This time it was the inequality in the upper half of the scale that was accentuated, suggesting that the post-computing technological wave disadvantaged groups with average levels of qualification. Meanwhile, the financialization of the economy propelled remunerations in the world of finance to levels comparable to those observed before the Second World War. A rocketing of financial bonuses (at least until the crisis of 2008) occurred everywhere, including France. In continental Europe the evolution of salary inequality has been less marked. But rising unemployment and falling job security have particularly affected the least qualified, dragging down their average income. In France this phenomenon was clear among those starting their careers, even before the Great Recession. According to the French Labor Force Survey, one to four years after the end of initial training, the unemployment rate among graduates of higher education in 2007 was only 9%, but it was 37% for young people with a basic technical school certificate. Thus, the less educated have been the first victims of mass unemployment arising from macroeconomic disequilibria and restructurings; and then of the drop in relative demand for them (the ICTs require qualified workers); and then of de-unionization, job insecurity, and finally the intensification of work linked to new organizations. To counter these mechanisms, both individuals and governments have increased their efforts at education to increase the level of qualification of those generations entering the labor market. Increasing the number of qualified workers has probably curtailed rising unemployment. But it has also contributed to accelerating the emergence of the new economy. Having access to increasingly qualified workers, firms have been able to demand greater versatility to make their investments in ICTs pay off, augmenting the demand for these technologies as well as the associated innovation effort. However, the increasing level of qualification of the workforce has not been sufficient to avoid distorting the global division of value added in favor of capital and the most highly paid, signifying a worldwide weakening of the bargaining power of individuals and most collectives. According to EU KLEMS (November 2009), labor's share of value added in the market economy slid from 73% in 1970 to 68% in 2007 within the EU 15. In the United States, over the same period, the division among workers has been most distorted; the highest-paid 10% have captured most of the gains, to the detriment of the other 90%. These distortions have become a major source of capitalism's instability. In parallel, one of the essential motors of economic growth-growth in the productivity of work-has run out of steam again, both in the countries of the G7 (apart from Japan) and in the Scandinavian countries (figure 2). According to the OECD productivity database, as an average over the years from 2008 to 2012, the hourly productivity of work stagnated, or even dropped, in the major European countries as well as in Scandinavia, though it was dynamic at the beginning of the century. The contrast is striking in comparison to the preceding recession, in the first half of the 1990s, when productivity sharply increased. North America has not escaped this slowdown; productivity gains are slowly falling to their levels before the "new economy." Yet, except for France and the United Kingdom, these countries are all putting historically unprecedented efforts into research and development. As in the 1970s and 1980s, technological progress no longer seems to translate into economic growth. Intense academic research is currently focused on analyzing this phenomenon, which seems consistent with a Kondratiev wave-that is, an industrial revolution reaching its maturity. In the OECD countries, the use of ICTs is now nearly universal. Likewise, the expansion of innovative work organizations seems saturated. Since the start of the 2000s, the process of work intensification has shown a clear-cut pause, at least in Europe. In several countries (including France and the United States), the slowdown of productivity gains preceded the Great Recession by several years. Alongside the financial excessesand the inability of European institutions to deal with the crisis (considered in chapter 7), this slowdown suggests an interpretation of today's deep crisis. On the one hand, faced with declining prospects in the productive sphere, investors and companies are engaged in a search for growth drivers through financial tools-effectively looking for virtual growth. On the other hand, the productivity slowdown feeds doubts regarding the long-term capacity of nations to pay back public debts, as well as regarding the durability of social protection. The crisis in sovereign debts might derive not from overspending but from potential economic growth being hampered by the long fading of productivity gains. The present period is comparable to the situation in the 1970s, and not only with regard to changing productivity. On top of that, the current political disarray of a Europe stuck in a long recession, of a Japan undergoing deflation, and of a United States faced with a "fiscal cliff"-all are reminiscent of the disarray that prevailed four decades ago. In the first half of the 1970s, the developed economies found themselves faced with several major challenges: falling growth, stalled productivity gains, and mass unemployment. In reaction, we find a common political schematic path derived from both domestic experiments and observation of neighbors' policies. The first phase of this schema dates from the end of the 1970s: to halt inflation, by modifying (via monetary policy) the expectations of economic agents (though this would accelerate the rise in unemployment) and by eliminating the economic mechanism of indexing salaries (despite the deepening of inequality). The second phase was much more heterogeneous: to cure sluggish growth and mass unemployment by taking the medicine of liberalism or by extending benefits and non-market jobs, while massively building up a better education system. The third phase was to reduce the transition period from one revolution to the next by fostering a return to growth drawn from productivity gains, and again by supporting innovation and education, and finally by reforming the markets for products and for labor. The fourth phase required a belief in the ability of the monetary authorities to contain crises, as well as in the self-regulation of economic and financial systems, to be "attested" by weak macroeconomic volatility. By eliminating the risk of crisis, this Great Moderation would permit more deregulation and render the dependence of nation-states on the exigencies of the markets less painful. This phase would be smashed with the Great Recession. Not all countries advanced along this schematic path at the same speed. Some (like France) seem never to have fully gone through the transition phase, which left them with appreciable margins of potential growth, at least until the world crisis of 2008. Others (like the United States) clearly passed through the transition, accompanied by massive investments in knowledge. But it is probably the United Kingdom that most precociously accomplished its industrial transition. The United Kingdom was one of the first countries to fall into stagflation, even before the first oil crisis. It was also one of the first to extricate itself, back in the 1980s. The renewal of the British economy was largely the result of the economic policy conducted by the Conservative governments of Margaret Thatcher. They were able to exploit important advantages inherited from their Labour predecessors: modern public services, effectivewelfare protection, a discovery of North Sea oil amid the second petroleum crisis, and significant and rationalized participation by the state in the competitive economy. In appearance, Thatcher's conservative revolution was an abandonment of any industrial policy: it included privatization, the elimination of subsidies to enterprises, and the absence of support for small or medium-size businesses. However, what is essential about this revolution can be read precisely as an industrial policy: the development of the City of London, and more generally of financial services to the commercial sector. This choice would prove astute. The financial industry is one of the first sectors to be thrown into upheaval by information and communication technologies, since it is one of the principal users of these technologies. Contrary to received opinion, information technologies have a tendency to accentuate the agglomeration of activities based on knowledge, rather than breaking them up. By halting investments in public services, the British government could finance a massive lowering of taxes for the wealthiest. The marginal income tax rate dropped from 80% to 40%. Thus, citizens with more than three times the median income had their taxes cut in half. On the one hand, this reduction enabled those in the highest income brackets to dispose of liquidities by shifting them into the financial system; on the other hand, tax cuts drastically contracted the socio-fiscal burden on the best-paid employees in the financial sector. The financial industry and its commercial services thus possessed the technological conditions, the domestic market, and the socio-fiscal environment-all of which were optimized for its development. At the cost of growing social inequality, of abandoning public services, of a collapse of the manufacturing industry and a consequent strong (but transitory) spurt in unemployment, and finally of vulnerability to the financial cycle, Great Britain was one of the first countries to recover gains in productivity, from the early 1980s, by surfing on the opportunities offered by information technology. This "Thatcher miracle" illustrates that an ultra-liberal policy of massively cutting the fiscal contribution of those in the highest income brackets is not an economic end in itself. To succeed across the Channel and in the wider world (at least in terms of growth), it had to be at the service of a specific policy of innovation. 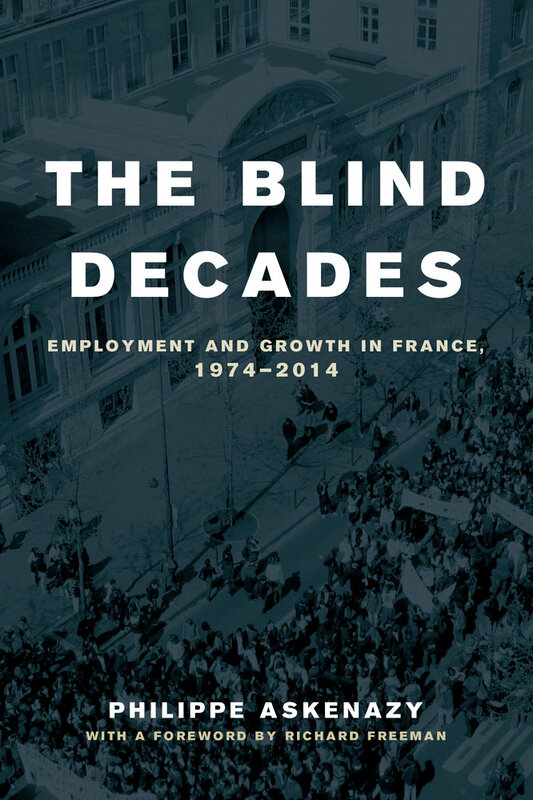 How can we understand why France never really exited from the crisis of the 1970s before entering that of 2008? Why was it unable to escape four decades of mass unemployment but able to maintain its economic status? This book's step-by-step review of the policies applied in France since 1970 will suggest answers to these questions. The decades of blindness that would afflict France cannot be explained by a total absence of relevant analyses of the contemporary world. Certainly in this chapter I have been examining the major economic changes since the 1970s after the fact. And of course, in the 1970s and 1980s an understanding of economic mechanisms was still very partial. But back in 1967, the French prime minister, Georges Pompidou (who would be president of the republic from 1969 to 1974), and his secretary of state for employment, Jacques Chirac (who would be either prime minister or president for sixteen years between 1974 and 2007), were in possession of a report by the planning commissioner, Fran√ßois-Xavier Ortoli, called Rapport sur les cons√©quences sociales de l'√©volution des structures de l'√©conomie (Report on the Social Consequences of the Changing Structures of the Economy). This report acknowledged the end of the postwar period of expansion: "In recent months these fears [by union organizations] have been reinforced by certain events: the moderate but continued rise in unemployment, the acceleration of company mergers, the difficulty experienced by some young people in finding a job after leaving school, and of certain managers in redeploying themselves" (p. 1). Farther along, we read: "These observations should not mask what is essential: a profound transformation in the labor market is underway. In order to proceed without serious social problems, this requires the creation of a first-rate arrangement that is exactly adapted to this new situation, an 'active jobs policy.' There is a rigorous link between the application of such a policy and the lucid acceptance of the social phenomena that always accompany progress" (p. 3). The report anticipated transformations in the economy and the labor market. "In a progressing economy, greater job mobility is inevitable and necessary" (p. 3). "Technological evolution, exactly where the demand is noticeably increasing, transforms the structure of employment by appealing to a labor force with different and higher qualifications. . . . We will shift from one type of economy to another, . . . from a highly protected market to an open market, to which we have to make a rapid series of structural adaptations" (p. 6). In admiring the results and institutions of the Scandinavian countries, the recommendations of the Ortoli report even referred to the principal components of what thirty years later would be called "flexicurity." Alas, this awareness of profound changes would be obfuscated by blindness among the political actors. Worse still, errors of analysis would be at the root of political mistakes whose consequences became structural. They also delayed appropriate reforms, though some major reforms concerning education and labor regulations were finally implemented. And France today still retains some major assets (an educated workforce, high productivity, an efficient health system, and so on-see chapter 8). Errors have been made by all French governments, despite a great variety of political configurations. From 1974 to 1981, president Val√©ry Giscard d'Estaing, of the pro-European center-Right, was flanked by a Gaullist prime minister, Jacques Chirac (from 1974 to 1976) and then by a centrist economist, Raymond Bare. Then came Socialist president Fran√ßois Mitterrand, from 1981 to 1995. He had seven prime ministers. Pierre Mauroy was at the head of a Socialist-Communist majority from 1981 to 1983, then reduced to Socialists alone; Laurent Fabius was the bearer of liberal social democracy from 1984 to 1986; from 1986 to 1988, a new Jacques Chirac became the apostle of Thatcherite reforms; Michel Rocard extended the presidential majority of the Socialists to a portion of the center-Right until 1991; Edith Cresson and Pierre B√©r√©govoy adopted a management-style socialism; this was swept away in 1993 by the return of a wide coalition of Gaullists and Liberals directed by Edouard Balladur. Then, for the twelve years from 1995 to 2007, President Chirac had four prime ministers. The first was his right-hand man, Alain Jupp√©, until 1997. Then, for the five years of a leftist legislature, Lionel Jospin led a "pluralist majority" of Socialists, Communists, Greens, a nationalist Left and Social-Liberals. Then came (2002 to 2005) a pro-European centrist, Jean-Pierre Raffarin, who had a single party that assembled all the components of the Republican Right; and finally, from 2005 to 2007, the flamboyant liberal Gaullist, Dominique de Villepin. Nicolas Sarkozy, a one-term "hyper-president" (2007 to 2012) and an admirer of George W. Bush, relegated prime minister Fran√ßois Fillon to a secondary role. And finally, since 2012, the return of an (overly) "normal" president, Fran√ßois Hollande, has meant a government, directed by Jean-Marc Ayrault, that mixes Socialists, the center-Left, and the Greens. France is often described as one of the last Western economies unable to reform itself in the face of globalization. Yet its economy has not fallen by the wayside and has even resisted the great recession that began in 2008. By interlinking historical, economic, and political factors and by comparing France with other nations, this book explains the puzzle presented by the development of France. Understanding France's economy requires downplaying the usual policy injunctions—demands for less state control and less rigidity in the labor market—and instead stressing the importance of constructing a long-term industrial strategy. Philippe Askenazy is Senior Researcher at the Paris School of Economics and Director of Research at the French National Center for Scientific Research. He is the author of La croissance moderne (2002) and Les désordres du travail (2004), among other books. Richard Freeman holds the Herbert Ascherman Chair in Economics at Harvard University and directs the Science and Engineering Workforce Project at the National Bureau of Economic Research. Chapter 5. 1993–2002 : “New” Effective Policies?